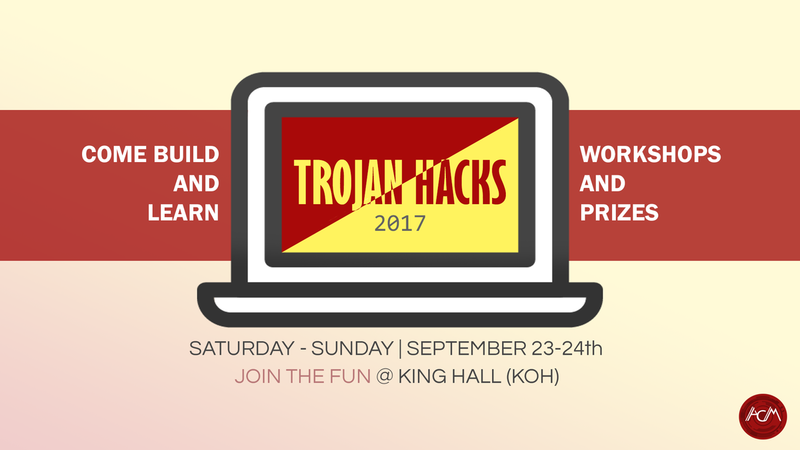 TrojanHacks 2.0 is a 24 hour hackathon for USC students this weekend September 23-24th. There will be free food, company swag, and lots of cool people. Come join us for the weekend and see what you're capable of and add to your development portfolio! TrojanHacks is an opportunity to learn! We'll have workshops on Android, IOS, Chatbots, and Web Development. Check out our website for information about schedule, prizes and more: bit.ly/TrojanHacks! Is this a product that people will use in their daily lives? Will it make lives better? How difficult was it to implement this project? Are there lots of APIs and libraries and languages involved? Did you use a really cool algorithm? Is this project unique and innovative? Is it a solution to a problem we have never seen before? A better way of doing something?